A pure saturated blue is one of the rarest and most treasured colors in the gemstone world. Though there are a number of gem varieties found in blue, really only sapphire is found in a pure saturated blue. Tanzanite may occasionally come close, though even the finest tanzanite always has a tinge of violet. Most blue gemstones occur in lighter shades of blue, such as the sea blue of aquamarine. Deeper blues may be found in zircon and tourmaline, but the color is rarely pure. 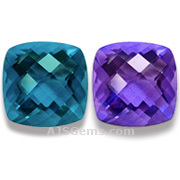 Some blue gems, such as blue topaz, have been heavily treated to produce the blue color. Here is a brief tour through the world of blue gemstones, including some rare and less familiar gems. 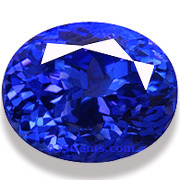 Blue sapphire is the finest of all blue gemstones, combining excellent color saturation with superior hardness (9 on the Mohs scale) and luster. Transparent specimens are faceted, while more included material is cut as cabochons. 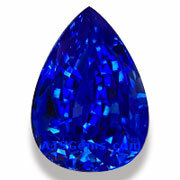 Tanzanite is typically bluish-violet to violet-blue, and especially fine examples can rival top blue sapphire for color. 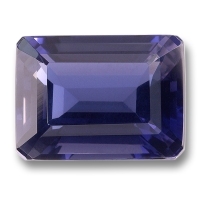 But tanzanite is a much softer gem than sapphire, with a hardness rating of only 6.5. Spinel is best known for its vivid reds and pinks, but spinel is occasionally found in blue. 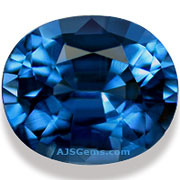 Most blue spinel has a significant gray modifier, and a pure blue is very rare. 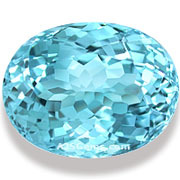 A member of the beryl family, aquamarine is popular for its pastel blue color and excellent clarity. 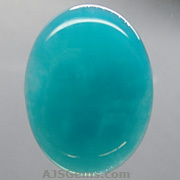 Aquamarine can also be found in large sizes and the bigger stones tend to have a more saturated color. Zircon is prized for its high refractive index and impressive fire. Blue zircon is found in Cambodia and Burma, and the color is typically a medium blue with a slight green secondary hue. Blue Tourmaline is also known as indicolite. 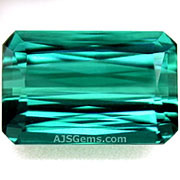 It is one of the rarest colors in tourmaline, and is usually a greenish blue. The rare paraiba tourmaline can be found in a remarkable neon blue. The rarest gem in the quartz group is know as Gem Silica. The best specimens, from the Inspiration Mine in Arizona, have a vivid turquoise color with good translucency. Benitoite is a rare barium titanium silicate first found in San Benito, California. Thus far gem quality material has only been found in the original location, and this rare stone was named the official state gem of California. Benitoite has a hardness of 6 to 6.5 on the Mohs scale. 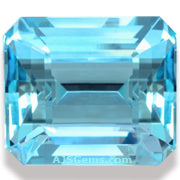 Topaz only rarely occurs in blue in nature and virtually all of the blue topaz in the market has been produced by irradiation, followed by heating. Blue topaz is available cheaply and in vast quantities in the market, and is mainly used in inexpensive commercial jewelry. Apatite is a phosphate mineral that is typically green, but can sometimes be turned a vivid greenish-blue by low temperature heating. 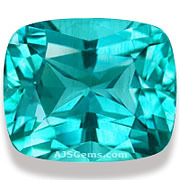 The color can rival the best paraiba tourmaline. The main limitation of apatite is that it is quite soft (5 on the Mohs scale). Fluorite occurs in a wide range of colors, including a rare color change variety that changes from blue under natural light to violet under incandescent light. Fluorite can be found in large sizes, but it is quite a soft material, rating only 4 on the Mohs scale. Iolite is typically bluish violet in color. It exhibits strong pleochroism, showing different colors from different angles (usually light blue, yellowish gray and violet). Though it is reasonably hard -- 7 to 7.5 -- it is typically found only in small sizes. Kyanite can sometimes be found in a sapphire-like blue, but the color consistency tends to be poor, with blotches or streaks typical in most specimens. Kyanite has a variable hardness, with a hardness of 4 to 4.5 along the long axis and 6.5 at right angles to the long axis.